Long-term, broad-scale ecological data are critical to plant research, but often impossible to collect on foot. Traditional data-collection methods can be time consuming or dangerous, and can compromise habitats that are sensitive to human impact. Micro-unmanned aerial vehicles (UAVs), or drones, eliminate these data-collection pitfalls by flying over landscapes to gather unobtrusive aerial image data. A new review in a recent issue of Applications in Plant Sciences explores when and how to use drones in plant research. "The potential of drone technology in research may only be limited by our ability to envision novel applications," comments Mitch Cruzan, lead author of the review and professor in the Department of Biology at Portland State University. Drones can amass vegetation data over seasons or years for monitoring habitat restoration efforts, monitoring rare and threatened plant populations, surveying agriculture, and measuring carbon storage. "This technology," says Cruzan, "has the potential for the acquisition of large amounts of information with minimal effort and disruption of natural habitats." For some research questions, drone surveys could be the holy grail of ecological data. Drone-captured images can map individual species in the landscape depending on the uniqueness of the spectral light values created from plant leaf or flower colors. Drones can also be paired with 3D technology to measure plant height and size. Scientists can use these images to study plant health, phenology, and reproduction, to track disease, and to survey human-mediated habitat disturbances. Researchers can fly small drones along set transects over study areas of up to 40 hectares in size. An internal GPS system allows drones to hover over pinpointed locations and altitudes to collect repeatable, high-resolution images. Cruzan and colleagues warn researchers of "shadow gaps" when collecting data. Taller vegetation can obscure shorter vegetation, hiding them from view in aerial photographs. Thus, overlapping images are required to get the right angles to capture a full view of the landscape. The review lists additional drone and operator requirements and desired features, including video feeds, camera stabilization, wide-angle lenses for data collection over larger areas, and must-have metadata on the drone's altitude, speed, and elevation of every captured image. After data collection, georeferenced images are stitched together into a digital surface model (DSM) to be analyzed (see Figure). GIS and programming software classify vegetation types, landscape features, and even individual species in the DSMs using manual or automated, machine-learning techniques. To test the effectiveness of drones, Cruzan and colleagues applied drone technology to a landscape genetics study of the Whetstone Savanna Preserve in southern Oregon, USA. "Our goal is to understand how landscape features affect pollen and seed dispersal for plant species associated with different dispersal vectors," says Cruzan. They flew drones over vernal pools, which are threatened, seasonal wetlands. They analyzed the drone images to identify how landscape features mediate gene flow and plant dispersal in these patchy habitats. Mapping these habitats manually would have taken hundreds of hours and compromised these ecologically sensitive areas. Before drones, the main option for aerial imaging data was light detection and ranging (LiDAR). LiDAR uses remote sensing technology to capture aerial images. However, LiDAR is expensive, requires highly specialized equipment and flyovers, and is most frequently used to capture data from a single point in time. 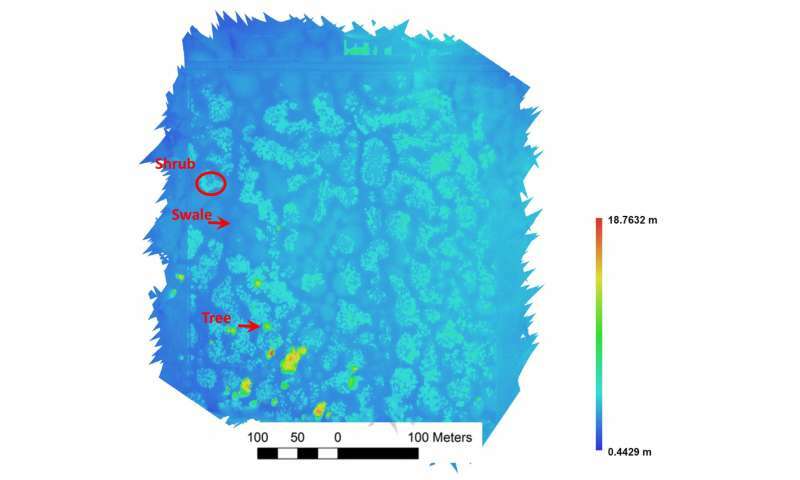 "LIDAR surveys are conducted at a much higher elevation, so they are not useful for the more subtle differences in vegetation elevation that higher-resolution, low-elevation drone surveys can provide," explains Cruzan. Some limitations impact the application of new drone technology. Although purchasing a robotic drone is more affordable than alternative aerial imaging technologies, initial investments can exceed US$1,500. Also, national flight regulations still limit drone applications in some countries because of changing licensing regulations and restricted flight elevations and flyovers near or on private lands. Also, if researchers are studying plant species that cannot be identified in aerial images using spectral light values, data collection on foot is required. Despite limitations, flexibility is the biggest advantage to robotic drone research, says Cruzan. If the scale and questions of the study are ripe for taking advantage of drone technology, then "using a broad range of imaging technologies and analysis methods will improve our ability to detect, discriminate, and quantify different features of the biotic and abiotic environment." As drone research increases, access to open-source analytical software programs and better equipment hardware will help researchers harness the advantages of drone technology in plant ecological research.